In the two years that have passed since Failer garnered Kathleen Edwards a wealth of critical praise and a sizeable cult of fans, much has changed in her life. On the Canadian singer-songwriter’s sophomore effort Back to Me, she reflects with bittersweet introspection upon the path onto which she has wandered. Indeed, as much as she longs for the familiar patterns of her past, she also is disconnected from them, separated by her time on the road as much as she is by her own personal growth. True, the album is stuffed with a similar batch of sad tales about disappointing and, at times, dreadful relationships — in fact, In State is a sequel of sorts to Failer’s opening Six O’Clock News — and Edwards still can’t seem to stop herself from falling in love with the wrong guy. Yet, there also is a sense of optimism and hope that creeps into her material, and although she’s come to accept some of her failings, she’s also found ways to move beyond them. Instead of admitting she’s written a song that radio won’t touch, she now is willing to bet the bank on her ability to achieve success. Throughout Back to Me, Edwards continues to refine her approach to crafting a tune, but while her sense of melody is stronger and her lyrics are more mature, the polished production of the collection’s 11 tracks sometimes threatens to derail the emotional impact of her musings. There’s no doubt that this was a deliberate strategy, one which was designed to distance her from the many comparisons to Lucinda Williams that greeted her in the wake of Failer’s release. On Back to Me, the edgier songs — Independent Thief and the title track, for example — angrily chug along their respective grooves while blurring the line that separates Tom Petty from Neil Young, while softer selections such as Pink Emerson Radio and Old Time Sake strike a more wistful pose in an attempt to match the hushed and haunted air of outings by Beth Orton and Jesse Sykes. Edwards still seems to be trying on a variety of personas in order to determine which one fits most comfortably, but in the process, she sometimes forgets to allow a little bit of herself to peek around the corners of her songs. At its best, however, Back to Me fulfills the promise of her debut, while laying the groundwork for the better things to come. 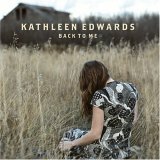 Back to Me is available from Barnes & Noble.